Years ago, Marshall McLuhan aptly remarked world as a ‘global village’. Quite evident, as it is today, the seamless exchanges of ideas, culture, people and of course food, across borders. People have migrated from one region to another for various reasons. With them, travelled the food culture. This has also lead to the heterogenisation of food culture. And offcourse, its evolution. There seems to be no such thing as local food now, the food being eaten in one part of the globe is easily available in another part. South Asia is one region where eating habits in most of the countries shares a lot of commonality. To promote the cross cultural collaborations between nine South Asian Countries, a movement titled “Sasian Journey”, has been led by the Asian Heritage Foundation and Self Employed Women’s Association, in collaboration with prominent NGOs of the region in engagement with the Smithsonian Institution, USA. They are hosting Lotus Bazar, the flagship market development package conceived for deserving artists, artisans, cooperatives and cultural enterprises through design let interventions. 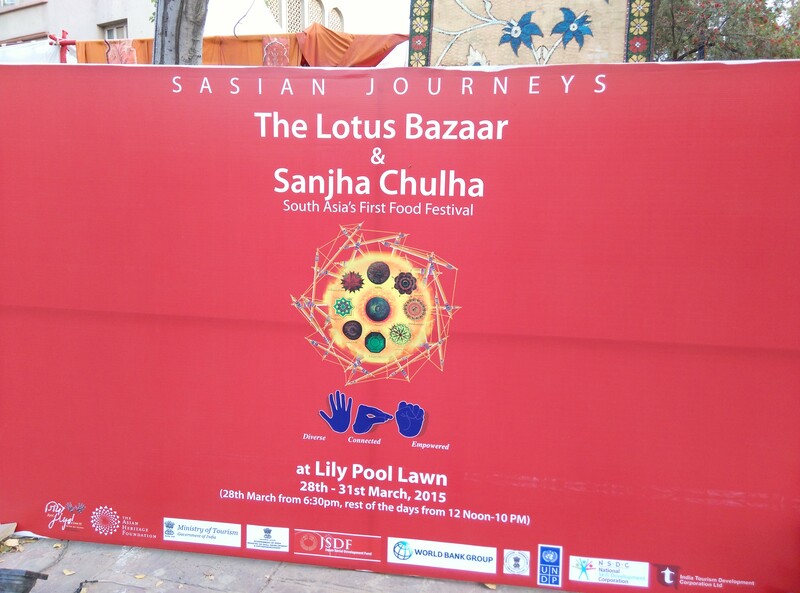 The Lotus Bazar has also on offer- South Asia’s first food festival- Sanjha Chulha, which literally means Common Kitchen. The festival has been curated by food critic and scholar Dr. Pushpesh Pant to promote the incredible variety of local and regional cuisines of South Asia showcasing the diversity of culinary art. The dishes are cooked by the in-house team of The Ashok Hotel led by the Executive Chef, Mr. Lumba. The festival is on till 31st March at The Lilly Pool Lawn at The Ashok, Chanakyapuri and entry is free.